Yamaha YDP 143 Digital Piano Review - Is this review worth a look? If are looking for a versatile and easy-to-use digital piano, then look no further. The Yamaha YDP 143 Digital Piano is the product for you. It is very beginner-friendly. Also, it comes with fifty classic piano songs. Listen or play along to these classics and improve your piano skills. But, never fear. The Yamaha YDP 143 is not just a digital piano for beginners. There are a number of features that allow you to advance your piano technique. Importantly, there is the two-track recording capabilities and iOS connectivity. If you like the piano and technology, then the Yamaha YDP 143 is for you. Want to learn more about the Yamaha YDP 143 Digital Piano? Read on. When you’re searching for a great digital piano, the specifics are very important. Below, find the important specifics that set the Yamaha YDP 143 apart. If you want to learn more about the best digital pianos, see our articles here and here. Specifics are important, but the features of the Yamaha YDP 143 really distance it from its competition. The Yamaha YDP 143 has the keyboard features that one would want in a digital piano. 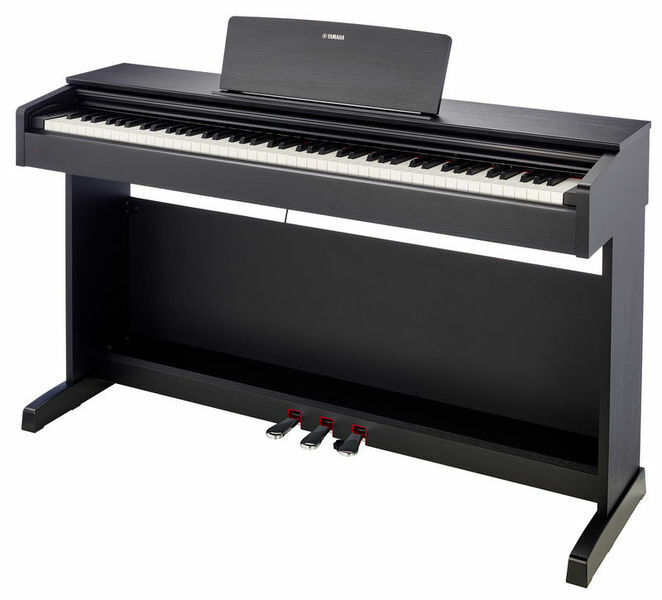 All of Yamaha’s Arius Series Digital Console Pianos have weighted keyboards. We’ve also created a list of the best digital pianos with weighted keys to provide you with more options in that category. The weighted keyboard on the Yamaha YDP 143 has a GHS system. Thus, the keys are heavier in the lower register and lighter in the upper register. Essentially, this makes the YDP 143 Digital Piano feel just like an acoustic piano. Another advantage of the weighted keyboard is the ivory-topped keys. Therefore, playing on this keyboard will actually improve your finger technique. Yamaha claims that playing on a YDP 143 is an advantage because of the weighted mechanism. Purchase a digital piano and improve your technique. It doesn’t get much better than that! The Yamaha YDP 143 sounds and feels like an acoustic piano. In order to do this, the YDP 143 come with the Pure CF Sound Engine. This sound engine is unique to Yamaha and combines realistic sound with sampling technology. However, the Pure CF Sound Engine is only available on the YDP 143 and YDP 163B. Plus, there are ten unique voices included in the Yamaha YDP 143. You can quickly and easily switch between them. You will be surprised at how switching between the voices changes the way that your playing sounds. Finally, the polyphony of the Yamaha YDP 143 is top notch. It is a very good 192. The more polyphony your digital piano has, the more realistic its sound. And the Yamaha YDP 143 is one of the best in this regard. The number of voices, the high level of polyphony, and the default tone set the Yamaha YDP 143 apart. Therefore, it is no wonder that this digital piano is so popular. The YDP 143 comes with many different digital features. One of the most important is the ability to use a standard USB cable. Once the USB cable is connected to a computer or mobile device, you can download and use the “Digital Piano Controller” app. Additionally, iOS devices can be connected to the Yamaha YDP 143 through the Lightning-USB Camera Adaptor or the Yamaha UD-BT01. Finally, you can use the “Digital Piano Controller” app with your iOS devices. The digital features of the Yamaha YDP 143 open up a new world. You can adjust the digital piano’s setting, choose new voices, or record your playing by using these features. Truly, the Yamaha YDP 143 has it all. The Yamaha YDP 143 has a number of pros and cons that need to be considered. The overall playability of the Yamaha YDP 143 is extremely high. They keyboard and pedal feel and respond just like an acoustic piano. This means that you can easily move your playing technique from this digital piano to an acoustic piano. The sound and feel of this digital piano is top-notch. 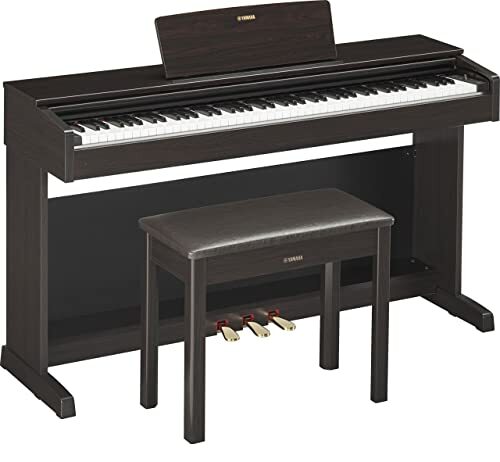 The Yamaha YDP 143 looks and plays just like an acoustic piano. If you are an acoustic player purchasing your first digital piano. Or, if you are a beginner planning on transferring your skills from a digital piano to an acoustic one. The Yamaha YDP 143 has something to offer you. The inclusion of the new-and-improved headphone jack on the Yamaha YDP 143 is a major plus. Thus, it allows you to play quietly without disturbing anyone else in the home. Plus, Yamaha’s stereophonic optimizer gives you a unique listening experience. Like its sister the YDP 163B, the Yamaha YDP 143 is quite heavy. 119.7 pounds to be exact. This will mean that you are not moving this digital piano around. It is not a good portable piano option. However, if you are looking for a portable piano, check out our article here. 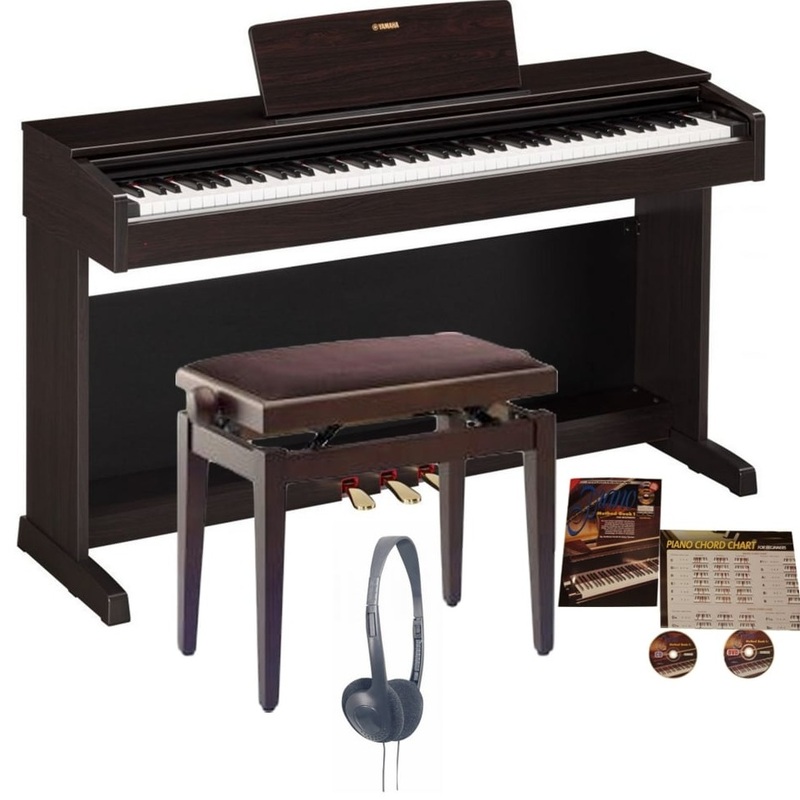 Most users notice that the keys of the Yamaha YDP 143 do not feel exactly like acoustic piano. Users have also complained that the keys are lighter than the rest of the Arius series. If you are looking for the most realistic keyboard, then you should go with the Yamaha YDP 163B, But, if the keys are not as important as the price, purchase the YDP 143. The Yamaha YDP 143 is a great digital piano. It is easy to play. Additionally, it includes most of the features of the more expensive Arius series digital pianos. Also, it can be used by iOS devices and plays exactly like an acoustic piano. Finally, if you want a digital piano that will help your transition from a novice to an advanced player, the Yamaha YDP 143 is for you. Try out the Yamaha YDP 143 today. The digital piano will confirm all you’ve read today. If you want other digital piano options, check out our articles here and here.